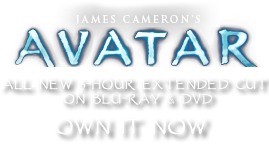 Battle Camp Paint Brush | Pandorapedia: The Official Guide to Pandora | Own AVATAR on Blu-ray & DVD Now! Some of the symbols are used to endow certain animals with special protection. An animal (such as a viperwolf or sturmbeest, for example) will occasionally show remarkable bravery or kindness, or has proven helpful to a member of the Omaticaya clan. The animal is then marked “protected” using the symbology of the clan and will not be harmed by other clans. This is usually done through branding, paints or decoration (unless the animal is so aggressive as to preclude such markings). Function A ceremonial brush used with warpaint. Size and Weight Various sizes, roughly .5 kilograms. Materials and Construction Tightly woven fiber, wood, leather, plant sinew. The wooden handle is carved and shaped from a nonporous hardwood. The decorative parts are woven and constructed. Note Painting is meticulous. It is considered sloppy for paint to interfere or cover the bioluminescent markings of man or animal.